In the upcoming edition of the Stanford Social Innovation Review, IISC gets a mention for our work with both Grantmakers for Effective Organizations and their Change Agent Project as well as the work we did with our client The Davis Foundation and their project Cherish Every Child. In each instance IISC partnered with our client by providing them a collaborative approach and architecture that scaffolded them in their pursuit of their collaborative goals. Our job is to design and facilitate the strategic thinking and consensus building process that yields the very best outcome. 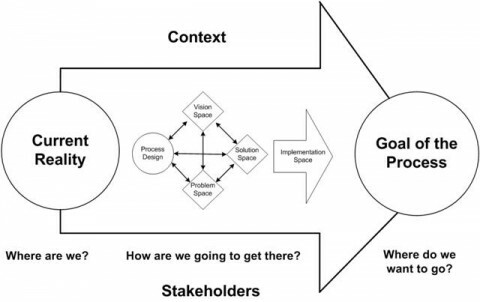 Yet here is the thing…when we present our methodology (presented above in what we call our Pathway to Action, a meta frame for collaboration) to colleagues, they very often have what can only be described as a schizophrenic response. I am told, “you seem to have a very successful approach to collaboration but we worry that it is too rigid and may not work for us”. Typically this statement comes after multiple conversations regarding the flexibility of the model and how it provides us with the structure that allows for the very freedom and innovative space that is needed. I think of these conversations as metaphors for the more existential reflections on freedom and autonomy in relationship to structure and discipline. I remember being in conversation with a Benedictine monk and understanding the relationship between these opposites for the first time. He was explaining the “horarium”, the hourly schedule kept by monks every day of their lives. The purpose of the horarium in monastic life is to provide a disciplined structure within which the monk can find the ultimate freedom to focus their mind on the present moment and their connection to the divine. How do you understand the connection between structure and freedom? Great question, Marianne! I find examples all around me. The greatest improvisational jazz artists were those who first mastered the discipline and structure of their instrument, harmony, melody, etc. The most fun I’ve had with partner-dancing was the freedom to experiment and the joy of improving created as I followed the structured lead of my more advanced dance partner. Memorizing Scripture provides a platform for freedom in drawing closer to God in every day life. Even in parenting–I always tell my kids that the true mark of adulthood is not freedom from constraints, it’s the freedom to choose the constraints within which we will live in order to grow, develop and contribute to the world around us. I find that the key in all of these examples is to choose structures whose mastery can give rise to creativity, freedom and growth. I’m with you and Cynthia Marianne – thanks for offering the reflection. I am intrigued by the diversity of responses that are elicited by the word “freedom.” I too believe that structure facilitates freedom, as it is my experience with spiritual discipline. As long as we are alert enough not to confuse the map for the territory, structure can make beautiful, new and liberating things possible!